First edition, first print hardback published by The Cresset Press in 1965. 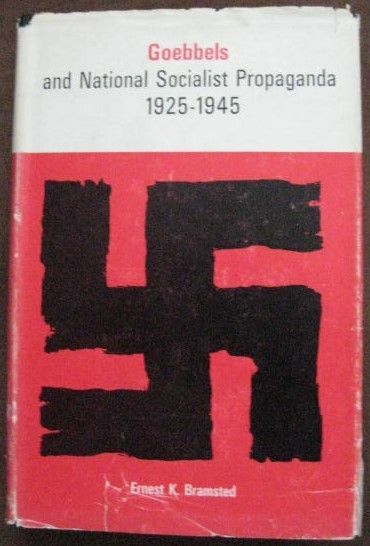 First edition, first print hardback of GOEBBELS AND NATIONAL SOCIALIST PROPAGANDA 1925-1945 by Ernest Bramsted and published by The Cresset Press in 1965. The book is in good+ condition (black cloth boards with gold lettering to spine) with light bumping to the top corner of the front and back boards and creasing to the top and bottom of the spine. The dust jacket, which is not price clipped, is in fair condition with creasing, rubbing, two thumbnail closed tears and one two inch closed tear to the top and bottom of the front cover, creasing and open tears to the top and bottom of the spine and one inch closed tears with creasing to the top and bottom of the back cover. The page edges are age spotted. Internally, the pages are lightly yellowed but tight and there are no tears and no inscriptions. During the Second World War and immediately after it the opponents of Germany failed to realize fully the significance of the Nationalist Socialist propaganda system and were inclined to underestimate its role in the establishment and maintenance of the rule of the Third Reich. Recently, as more facts on the life and the deeds of Goebbels have come to light, the pendulum has swung to the other extreme. This book does not attempt to offer a biography of Joseph Goebbels or to cover all the aspects of the propaganda octopus he built up over the years. It does attempt to place the development of Nationalist Socialist propaganda and the role of Joseph Goebbels as its chief protagonist in a clearer and better proportioned perspective than has hitherto been possible. 457 pages, plus Foreword, Appendix, Bibliography and Index.